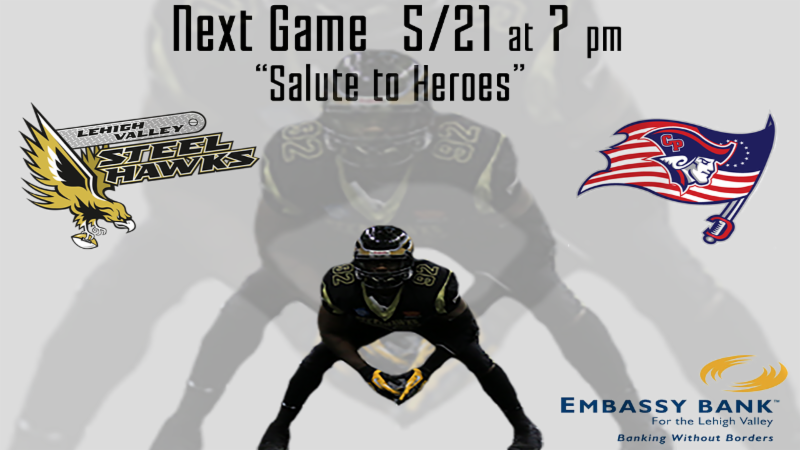 The 6-1 SteelHawks, owners of a share of first place in the AIF Northern Division, once again host the 3-4 Central Penn Capitals. The Harrisburg-area team was the squad who spoiled the ‘Hawks perfect season three weeks ago. A win guarantees the SteelHawks a home playoff game–most likely a first-round contest but perhaps a second round game if they pass the tie-breaks with River City and West Michigan. River City’s regular season is done, and I’m unsure of tie-breaks. If scoring differential is one of them, we’ll need to not only win, but win big tonight. One of the biggest keys to the game tonight, of course, is ball security. No way you want to turn the ball over like they did to Penn last time out. Our defense may not be the best in the league scoring-wise (close, but) but man do they take the ball away. This gives the offense that many more chances. I know Penn will be looking for it, but I go double move on those guys early and often. If they think they’re going to get easy INTs for TDs again they’ve got another thing coming. On defense, the ‘Hawks need to do what they do. Get after the QB with Big Larry Ford and force their own turnovers. Pay attention on special teams to get an additional point or two here and there and maybe an extra possession without giving anything extra up. They really should be able to take care of business, which is why my arrival will be somewhat dependent on how the IronPigs game is going. Parking: $6.00, arena garage may be pre-paid, parking authority facilities should have plenty of room. Tickets: Start at $10.00 plus fees; good seats still remain. Promotion: First 1,000 fans get a promotional cutting board! It’s “Salute to Heroes” night! C’mon out and help the team in advance of a home playoff game! If it rains, stop by after the IronPigs!